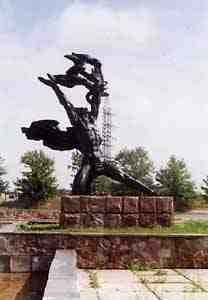 This sculpture was in the center of the town, it was moved to the nuclear power plant after the accident. Photos on this site are mostly mine or from my dad's archive. Few pictures were taken by other photographers. Unfortunately, I do not know the names of authors of those photos because I received them through the internet. If authors of those pictures can be found and want me to remove or add their names or include more photos on this site, here is my contact address.